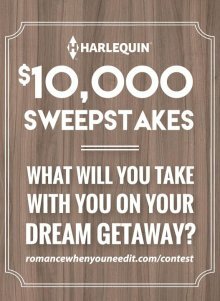 Harlequin is at it again with another great giveaway. This time it's for $10,000! As they say...now that summer is officially over and the kids are back to school, it is time to start planning your next escape! Enter for a chance to win a $10,000 gift card to create the escape of your dreams. What will you take with you on your escape? Here are some of the items Harlequin suggests.